I sustained a pretty serious foot injury in my car accident back in December. As a result, I have to use crutches. I’ve never used crutches before and, now that I have them, I wouldn’t wish crutches (or my accident and resulting injury in general) on my worst enemy. While, I’m stuck with them, I figured I may as well decorate them. I used to tell myself that I’m not creative, but that isn’t true. 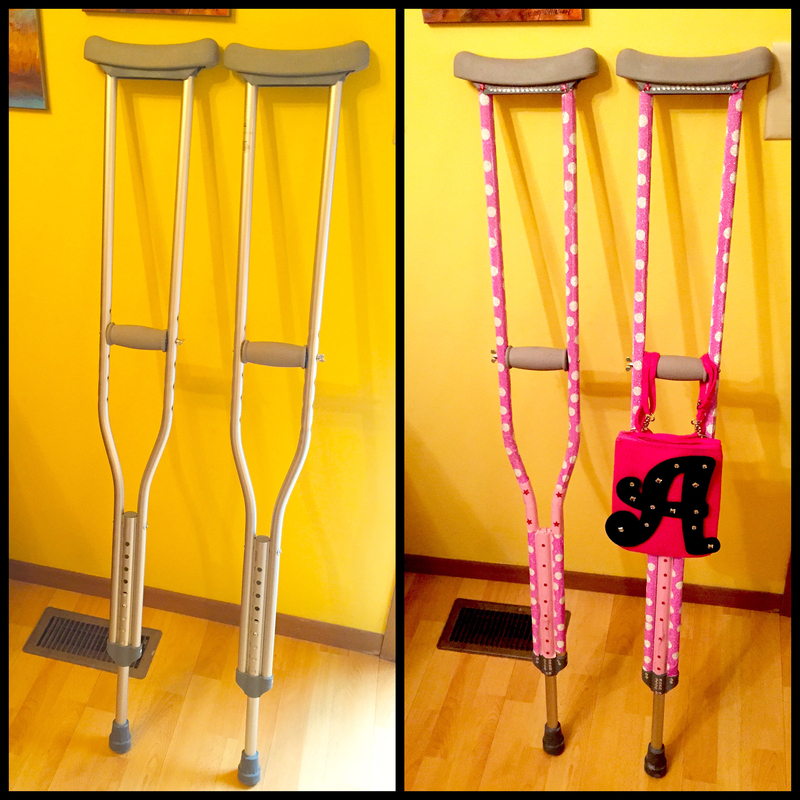 I love my pink crutches and they are SO FRIGGIN EASY to decorate! 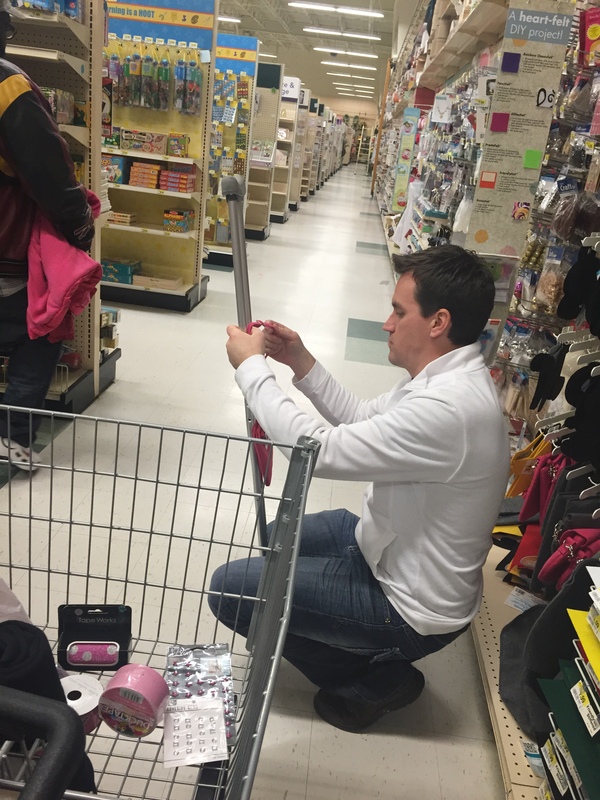 I went to Jo-Ann Fabric and Craft Store with my husband and got the supplies. 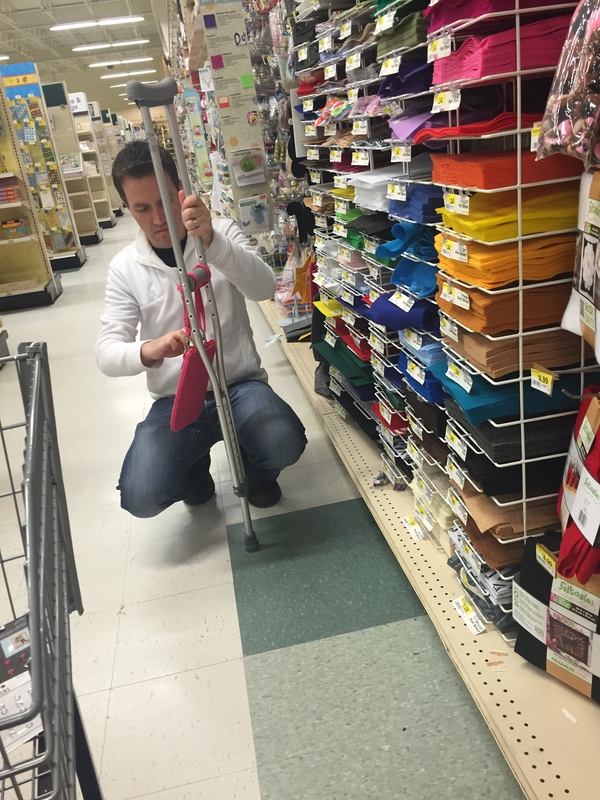 Joe checking to make sure this felt “pouch” will hang correctly on my crutches. You can see the supplies in my basket: decorative “Tape Works” tape, duct tape and decorative embellishments. I went with the decorative tape because it had the print I wanted, but duct tape sticks MUCH better. If you decide to use decorative tape, you’ll need packing tape to seal it and make it really stick. If the store doesn’t have a print you like and you have the patience, you’re better off going online and ordering the duct tape you want. When you’re getting your supplies, be sure to pick up a pouch. 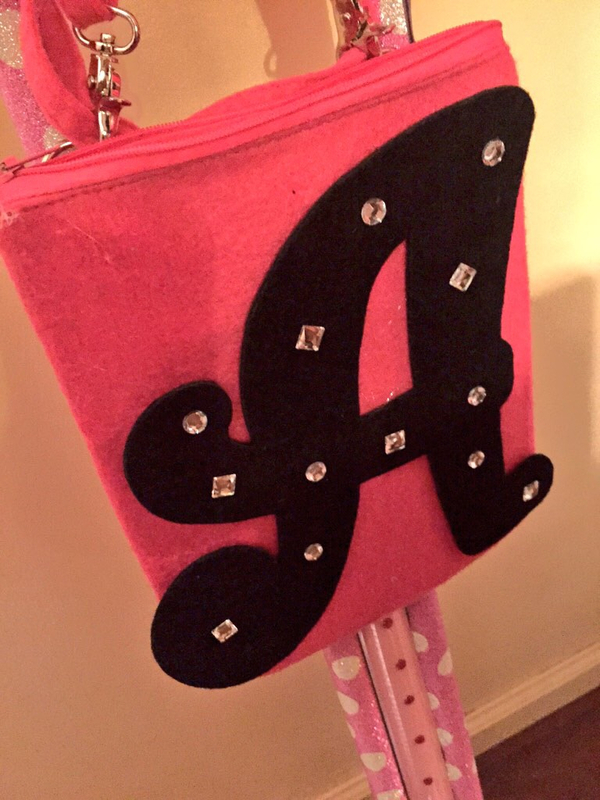 The felt bags are perfect. They’re light and they’re great to carry your phone, and other small miscellaneous items while your hands are occupied. 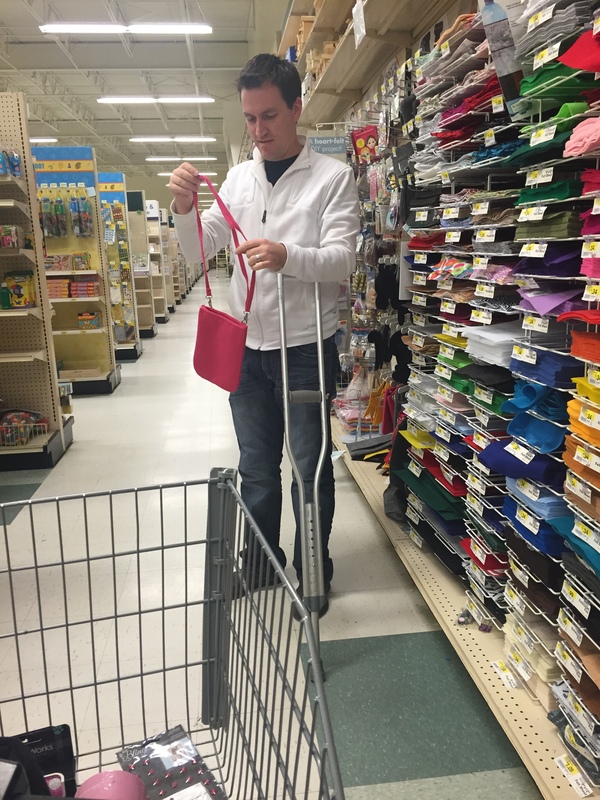 They sell bags for crutches online for $20, but save your money! 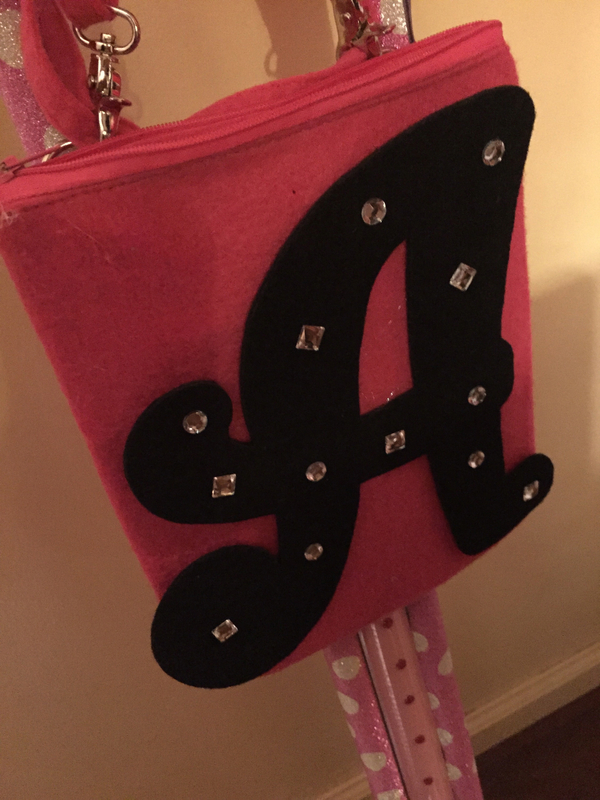 I got this one I got was about a dollar then I added the “A” and decorative embellishments to make it cute. Once you have your tape and decorative accessories, you’re set! 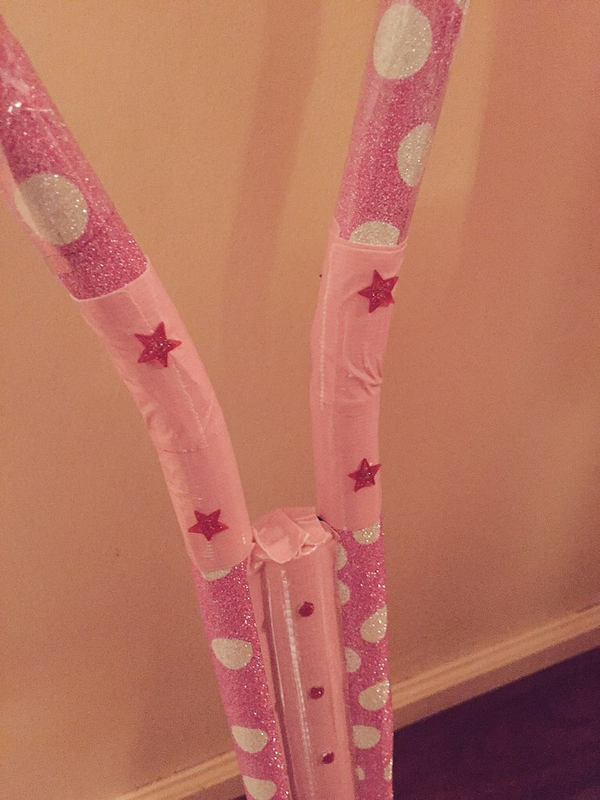 Now, all you need is about an hour, a hot glue gun and some scissors! Put the tape on length wise. Depending on the width of the tape, you may have to overlap it. Duct tape will stick fine, but the decorative tape may not stick to itself so that’s when you’ll need the packing tape. (Scotch tape will not work!) 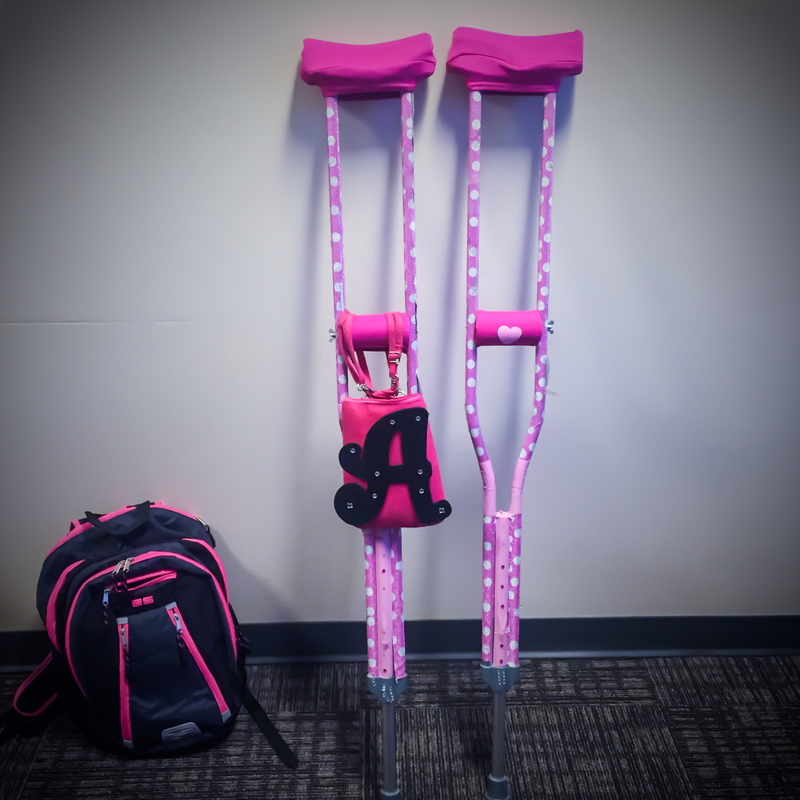 Feel free to use different prints – I used solid pink duct tape on part of the crutches just to change it up – or go with one print the whole way down. After you got the tape on, you can place the decorations using the hot glue gun. Decorate your pouch, then tie it around one of the handles and you’re good to go! 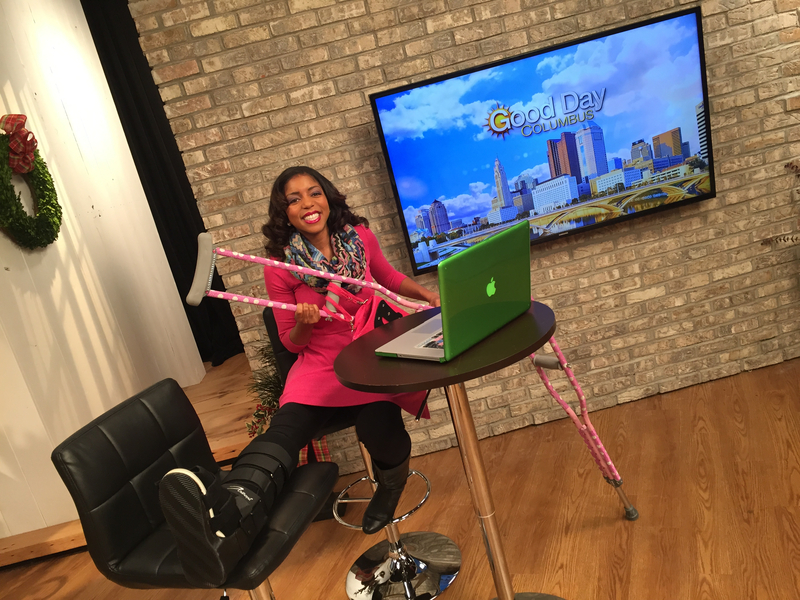 Back at work with my crutches! 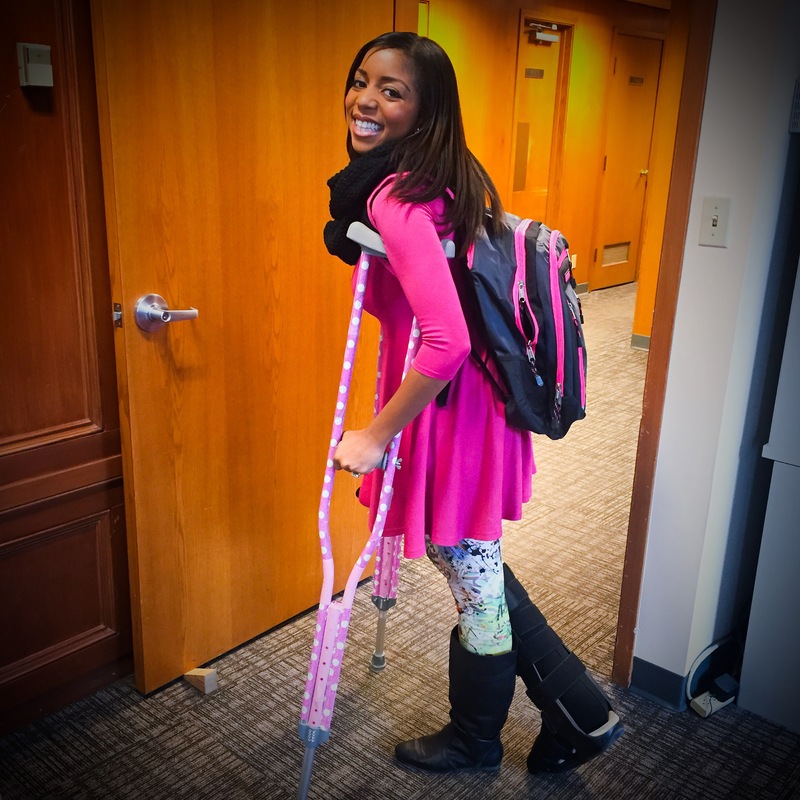 When you’re using crutches, the pouch is perfect for small items, but if you have to carry large items, you’ll probably need a book bag. I bought an inexpensive one at Walmart. It creates a “back-to-school” look, but it works! 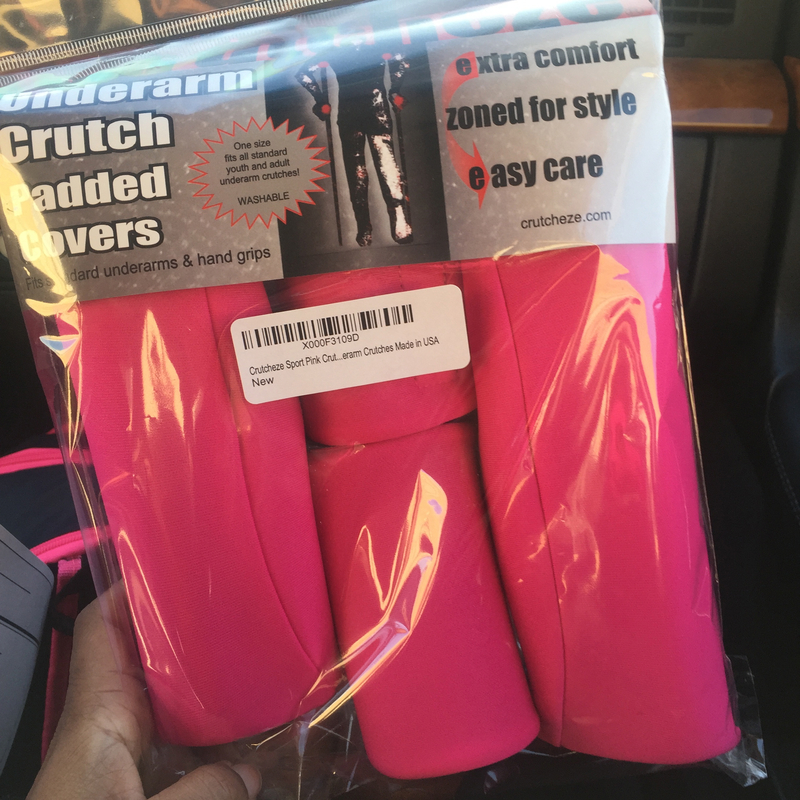 After using my crutches for a day or so, the area above my ribcage started getting really sore, so I bought these crutch pads online from “Crutcheze”. The underarm pads are the most useful. The padding really works! The hand grips are actually a little annoying because they mess up the grip, but together with the underarm pads they look super cute! I’m so glad I did this. They look like they’re made for kids, but I don’t care. Pink makes me smile and there isn’t much to smile about when you’re hobbling around on crutches every day. 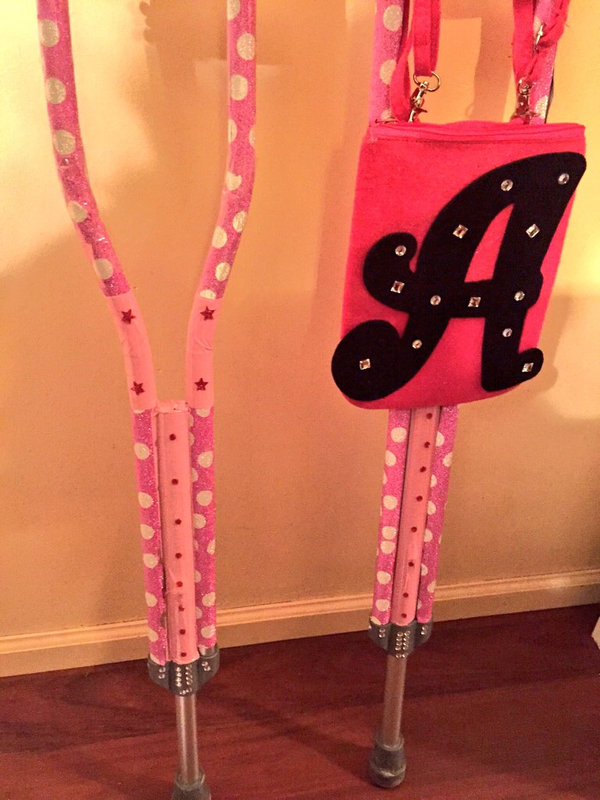 There are a few more examples of decorated crutches on Pinterest if you need more inspiration. Any questions? Leave a comment and I’ll answer as best I can! 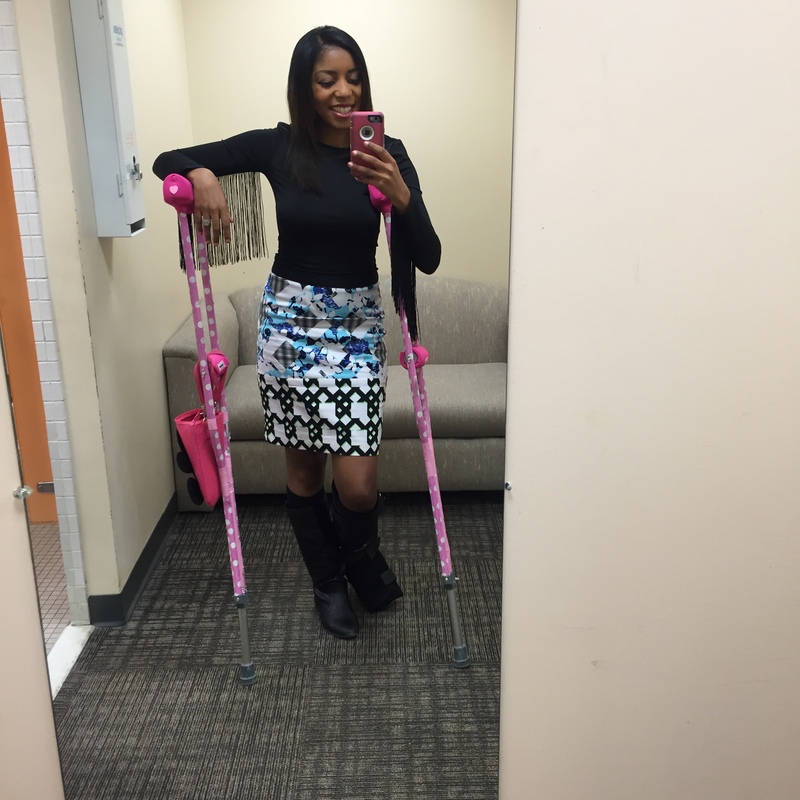 ← The Seven Week Itch – I’m Over This Injury! 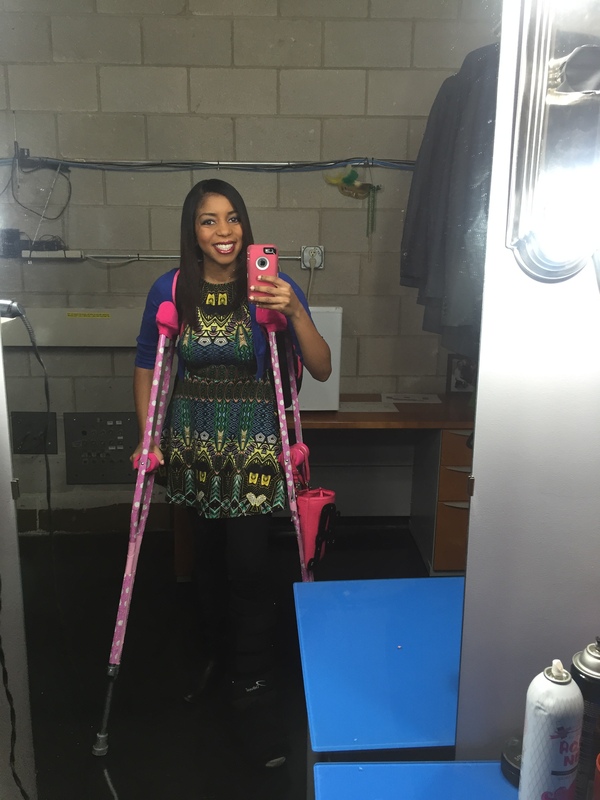 Hate that you’re in crutches, but love that you decked them out. 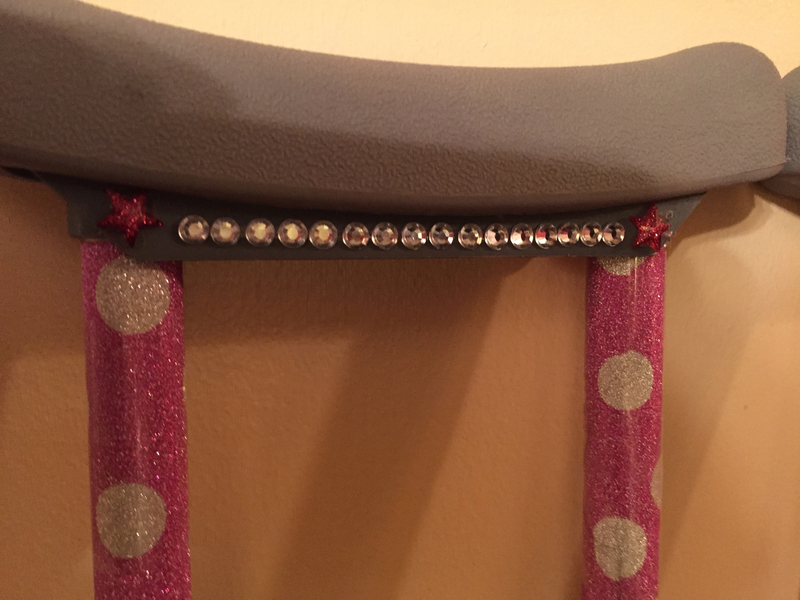 I will likely be on crutches for quite a while so I need to make them pretty. Thanks for the ideas. Alissa, thanks so much for posting this! 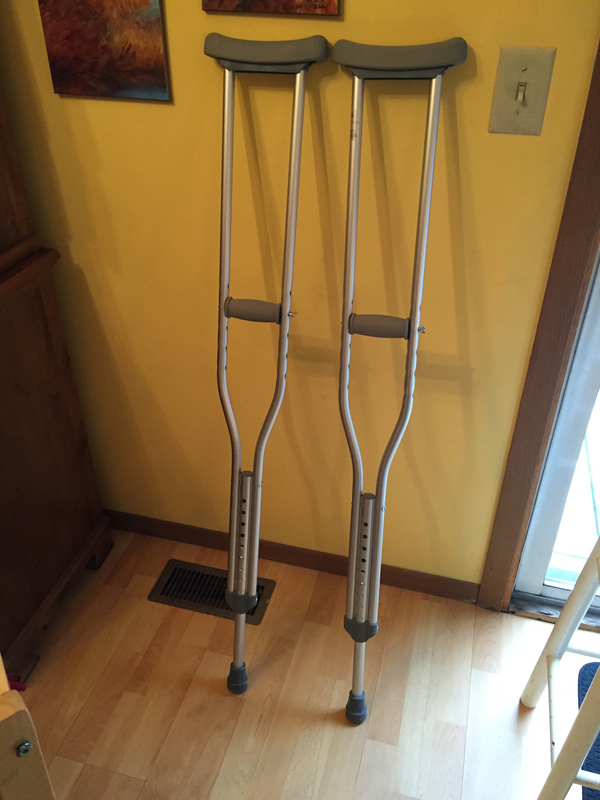 I will be on crutches for a couple months at least, and I hate the way they look. I got the bright idea to decorate them, and I was amazed at all the ideas online. Your pictures were the best, though, to help me get started. I have all my supplies and am anxious to begin. I’ll try to upload a pic when I finish. Thanks again! I’m stuck on a walker now so I’m planning on decorating it with the duck tape you can get at Walmart or Michaels that come in prints and colors. Thank you so much for the information on how to do it!!! Can’t wait to get the boring metal look gone!!! Thank you for taking the time to go through the steps. There are several ideas and images on Pinterest but not many that have the actual steps. Can’t wait to do this to mine.